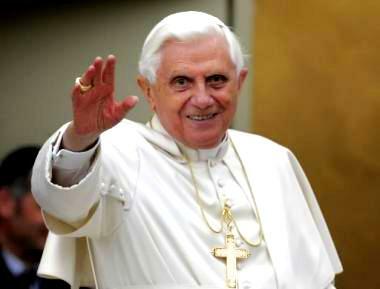 What a fabulous Papa we Catholics have in Pope Benedict XVI! We all miss Blessed John Paul II, of course, but God made sure that we got the best in his successor! This man is probably the greatest theologian ever! His books are best sellers, and his accomplishments-Restoring the Latin Mass at the request of the people, fixing the priest/bishop homosexual abuse scandal, and bringing hope and joy to millions - are legendary already. Here are some of his words of wisdom, which, if you think about it, are the words of the Holy Spirit! If we let Christ into our lives, we lose nothing, nothing, absolutely nothing of what makes life free, beautiful, and great. No! Only in this friendship are the doors of life opened wide. Only in this friendship is the great potential of human existence truly revealed. We are not some casual and meaningless product of evolution. Each of us is the result of a thought of God. Each of us is willed, each of us is loved, each of us is necessary. To make the sign of the cross is to pronounce a visible and public yes to him who died for us and who is risen, to the God who in the humility and weakness of his love is omnipotent, stronger than all the power and intelligence of the world. The happiness you have a right to enjoy has a name and a face: it is Jesus of Nazareth, hidden in the Eucharist. Dear young people, the happiness you are seeking, the happiness you have a right to enjoy has a name and a face: it is Jesus of Nazareth, hidden in the Eucharist. Only he gives the fullness of life to humanity! With Mary, say your own “yes” to God, for he wishes to give himself to you. In a world where there is so much noise, so much bewilderment, there is a need for silent adoration of Jesus concealed in the Host. Be assiduous in the prayer of adoration and teach it to the faithful. It is a source of comfort and light, particularly to those who are suffering. Receiving the Eucharist means adoring Him whom we receive. Only in this way do we become one with Him, and are given, as it were, a foretaste of the beauty of the heavenly liturgy. The act of adoration outside Mass prolongs and intensifies all that takes place during the liturgical celebration itself. 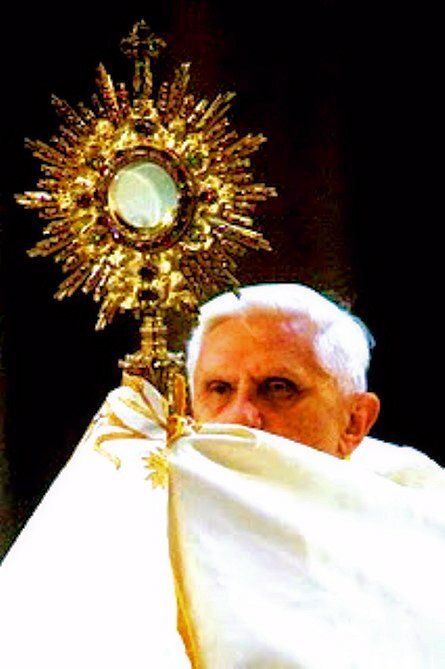 In the Eucharist, the Son of God comes to meet us and desires to become one with us; eucharistic adoration is simply the natural consequence of the eucharistic celebration, which is itself the Church’s supreme act of adoration. We are no longer able to hear God – There are too many frequencies filling our ears. God is not solitude, but perfect communion. For this reason the human person, the image of God, realizes himself or herself in love, which is a sincere gift of self. We were looking for a ‘good shepherd,’ and instead we got a German shepherd. We are moving toward a dictatorship of relativism which does not recognize anything as definitive and has as its highest value one’s own ego and one’s own desires. The church needs to withstand the tides of trends and the latest novelties. We must become mature in this adult faith, we must guide the flock of Christ to this faith. Grant that we may be one flock and one shepherd. Do not allow your net to be torn, help us to be servants of unity. Wherever applause breaks out in the liturgy because of some human achievement, it is a sure sign that the essence of liturgy has totally disappeared and been replaced by a kind of religious entertainment. Such attraction fades quickly – it cannot compete in the market of leisure pursuits, incorporating as it increasingly does various forms of religious titillation. Having a clear faith, based on the creed of the church, is often labeled today as a fundamentalism. Whereas relativism, which is letting oneself be tossed and ‘swept along by every wind of teaching,’ looks like the only attitude acceptable to today’s standards. That the Jews are connected with God in a special way and that God does not allow that bond to fail is entirely obvious. We wait for the instant in which Israel will say yes to Christ, but we know that it has a special mission in history now ... which is significant for the world. Faith in the resurrection of Jesus says that there is a future for every human being; the cry for unending life which is a part of the person is indeed answered. God exists: that is the real message of Easter. Anyone who even begins to grasp what this means also knows what it means to be redeemed. The church needs to profoundly relearn penitence, accept purification, learn forgiveness but also justice. In the United States, there is constant news on this topic (sexual abuse), but less than 1 percent of priests are guilty of acts of this type. The constant presence of these news items does not correspond to the objectivity of the information nor to the statistical objectivity of the facts. Many people today lack hope. They are perplexed by the questions that present themselves ever more urgently in a confusing world, and they are often uncertain which way to turn for answers. They see poverty and injustice and they long to find solutions. They are challenged by the arguments of those who deny the existence of God and they wonder how to respond.. Where can we look for answers? The Spirit points us towards the way that leads to life, to love and to truth. The Spirit points us towards Jesus Christ. In him we find the answers we are seeking. You might think that in today's world people are unlikely to start worshiping other gods. But sometimes people do worship 'other gods' without realizing it. False 'gods' are nearly always associated with the worship of three things: material possessions, possessive love, or power. If the divorced are remarried civilly, they find themselves in a situation that objectively contravenes God's law. Consequently, they cannot receive Holy Communion as long as this situation persists. This norm is not at all a punishment or a discrimination against the divorced and remarried, but rather expresses an objective situation that of itself renders impossible the reception of Holy Communion: '... If these people were admitted to the Eucharist, the faithful would be led into error and confusion regarding the Church's teaching about the indissolubility of marriage. After the Second Vatican Council, the impression arose that the pope really could do anything in liturgical matters, especially if he were acting on the mandate of an ecumenical council. Eventually, the idea of the givenness of the liturgy, the fact that one cannot do with it what one will, faded from the public consciousness of the West. In fact, the First Vatican Council had in no way defined the pope as an absolute monarch. On the contrary, it presented him as the guarantor of obedience to the revealed Word. The pope's authority is bound to the Tradition of faith, and that also applies to the liturgy. It is not "manufactured" by the authorities. Even the pope can only be a humble servant of its lawful development and abiding integrity and identity.... The authority of the pope is not unlimited; it is at the service of Sacred Tradition... . The greatness of the liturgy depends - we shall have to repeat this frequently — on its unspontaneity. We do not seek a Christ whom we have invented, for only in the real communion of the Church do we encounter the real Christ.